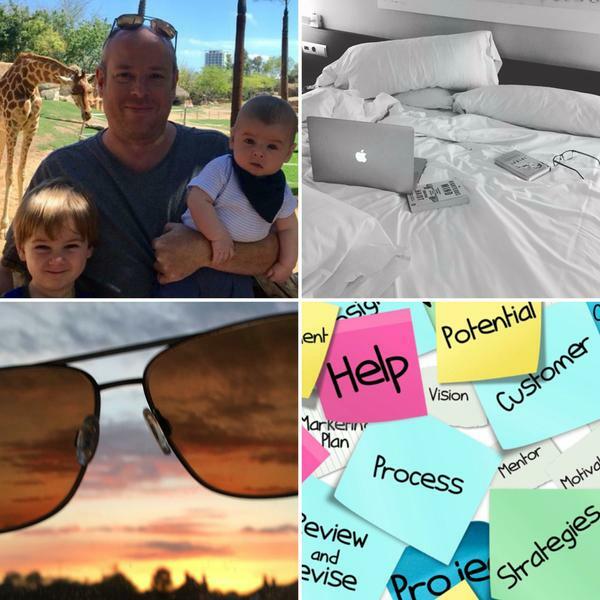 You are at:Home»Home Working Ideas»Job Spotter Review: Money While You’re in Town! Imagine I could tell you a way to earn money while you’re out walking. Imagine, even better, I could tell you how to earn money whilst out shopping. Well with Job Spotter, this is a reality – so read on to find out more! I’ve spent the past 18 months using Job Spotter, testing out the kind of income that this nifty little app can generate and judging whether it’s a worthwhile gig for home workers. My conclusion? It most certainly is! How Easy Is Job Spotter to Use? Job Spotter: How Much Money Can You Make? Job Spotter by Indeed is an app that allows you to earn money by taking photographs of job vacancies. You can also boost your earnings by verifying job adverts that other people have photographed. It’s so simple to use that almost anyone can make money with Job Spotter. 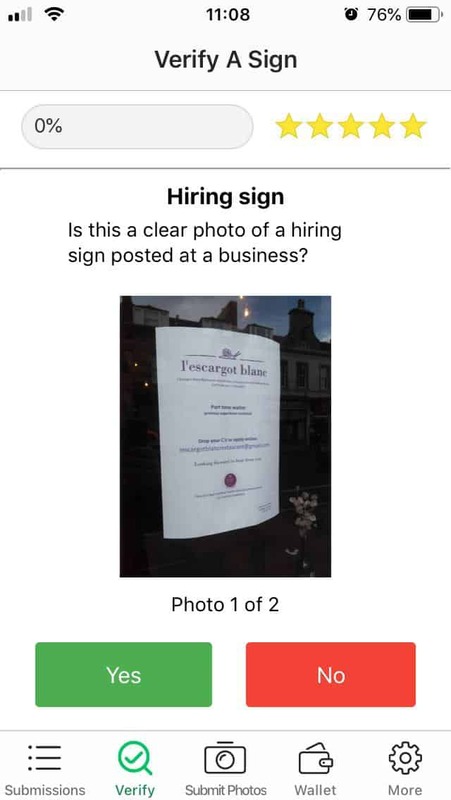 The premise is simple – while you’re out and about, you take photos of any job vacancy signs that you see and submit them via the app. Indeed can then add the jobs to their database. Payment is awarded for every approved submission, based on a sliding scale. We’ll get to how much you can earn a little further down this review. Registering for a Job Spotter account is simplicity itself. The app is available through the Google Play Store and Apple’s App Store. Download it for free, create an account by entering a username and email address, and away you go. Don’t take photos from inside your car. The written submission guidelines are more detailed, but can still be read and absorbed in two or three minutes. It’s worth noting that you also have to enable location services on your phone in order to use Job Spotter successfully. That’s because the app uses your location data in conjunction with the photos you submit in order to pinpoint the business with the vacancy. Job Spotter is incredibly easy to use. Every time you pop to the shops, keep a look out for help wanted signs. When you see one, open the app and tap ‘submit photos.’ Take a photo of the hiring sign and tap the ‘use’ button. Do the same with the shopfront. You will then be shown your two images. 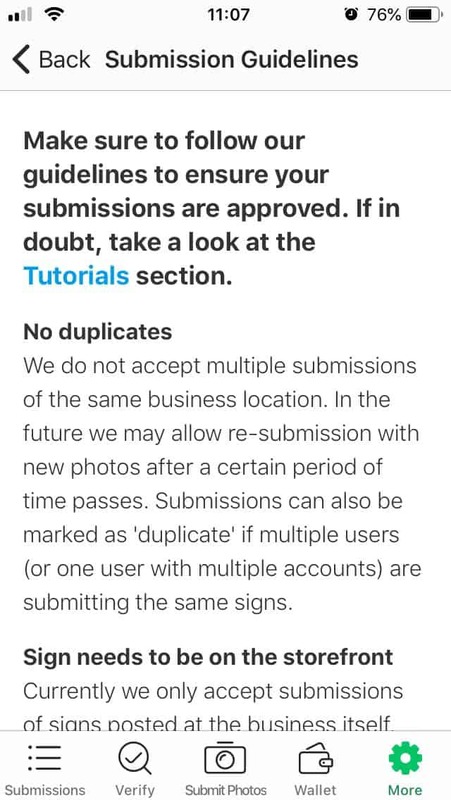 Click ‘submit’ to submit them, or ‘cancel’ if you want to retake one of the photographs for any reason. Your submission then wings its way electronically to Job Spotter and you’re ready to track down the next ‘help wanted’ sign. 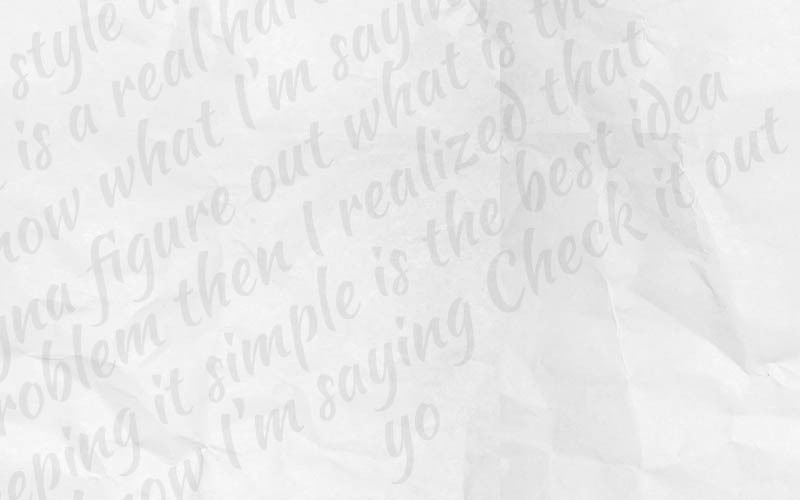 The whole process takes under 30 seconds. Job Spotter Verify is the part of the app that allows you to verify other people’s submissions. 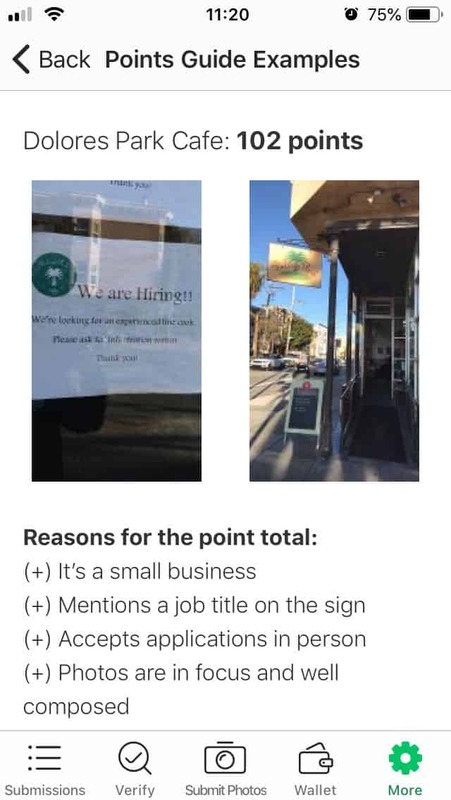 The app shows you a picture of a job vacancy and then of a storefront. 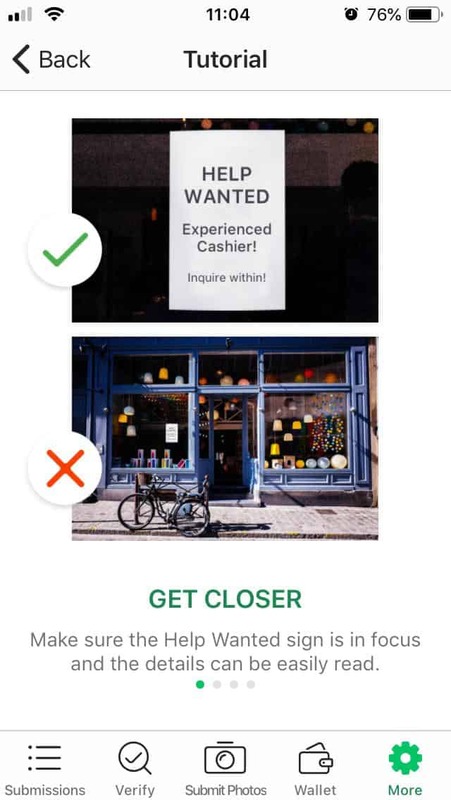 If the job advert is legible and the shop matches, the location description, you tap ‘yes’ – if they don’t, you tap ‘no.’ As with everything about the Job Spotter app, the process is incredibly easy. You are awarded a rating (up to five stars) based on how consistently your verifications match those of other Job Spotter users. The higher your rating, the fewer vacancies you have to verify in order to hit the payout level. A five-star user has to verify 20 job adverts in order to hit that level – a task which takes a little over two minutes to complete. 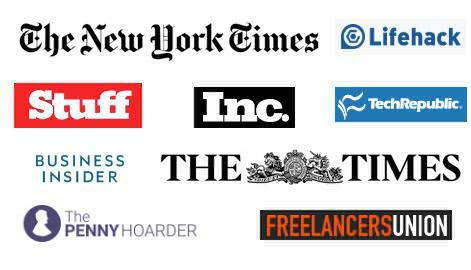 Job Spotter already has a big following in the US and the app’s top five users there all reportedly made the equivalent of more than $1,200 (£1,000) in a single year, with one user making $6,600 (£5,000). 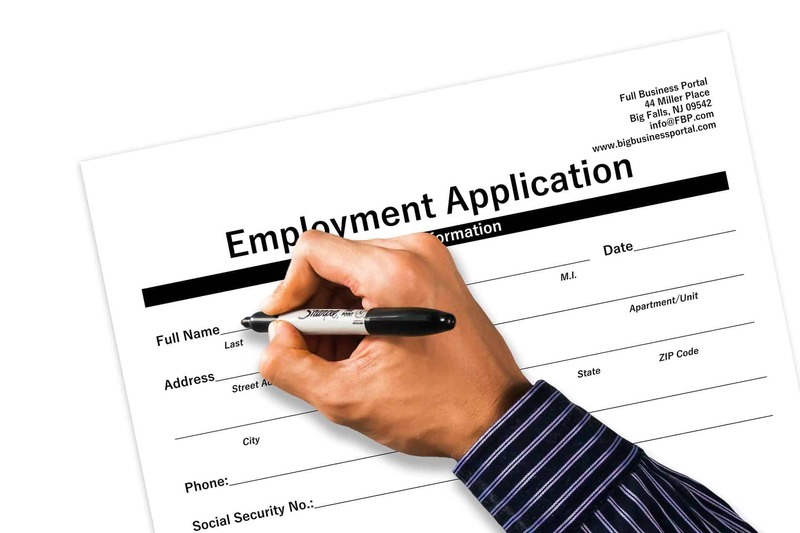 One great feature of the app is that you can submit as many job opportunities as you can find. There’s no limit to how many submissions you can make and thus no limit to your potential earnings, other than the number of jobs available in your local area. Unfortunately, that’s where we get to one of the issues with Job Spotter – if you work from home in a rural area then this app probably isn’t going to make you much money at all and you might want to look at alternative side work instead. However, for home workers who live in towns and cities and pop to the shops at lunchtime, or spend a day indulging in retail therapy at the weekend, Job Spotter offers excellent earning potential. Adverts for generic vacancies at large corporations are awarded far fewer points. The type of advert you submit can make a big difference. I netted £2.68 ($3.56) across my first four jobs, which included a local tearoom and an independent bakery. However, my fourth submission (a part-time position at a national footwear chain) earned me just 4 pence ($0.05). Job Spotter is definitely all about local businesses when it comes to stacking up points. I live in a very small town, with just over 7,000 residents, so there’s not an abundance of local shops available. In my first month of using the app, I racked up £3.23 ($4.29) while running my usual errands around town, for very little effort indeed. Over the coming months, I used Job Spotter regularly in my home town, as well as in other towns and cities that I visited. Over the following eight months, I earned an additional £17.04 ($22.63). I cashed out and then in the eight months following that, I earned £22.23 ($29.52). If I lived in a larger area, the earning potential would increase significantly. In a single day in Brighton, on England’s south coast, I built up around £8 ($10) thanks to the large number of independent stores that were looking for staff. The Wimbledon area of London, meanwhile, is around ten times the size of my little town and so offers ten times the earning potential – users in large urban areas should comfortably be able to make $40 (£30) or more in their first month of using Job Spotter. The earnings from the Job Spotter Verify function are far less impressive, working out to just 10 cents (7 or 8 pence) per 20 verifications. Even working at full speed for an hour, it would be hard to earn more than around $2.50 (£2). As the hourly rate you can earn through survey sites such as Prolific is much higher, I almost dismissed the verification function entirely. However, I do find myself drawn back to it from time to time. If I’ve got an idle couple of minutes waiting for a train, for example, it’s an easy way to add an extra few pence to my Job Spotter earnings – it won’t ever make me rich, but it beats playing Candy Crush! To maximise your Indeed Job Spotter pay, focus on independent stores rather than on national or international chains. The smaller the shop, the more you’ll add to your Job Spotter points value. Remember, too, to use Job Spotter wherever you go. Whether travelling on business or pleasure, you can use the app while you’re out and about. Job Spotter countries include the USA, UK, Australia and Canada. As well as being simple to use, Job Spotter is also a very reliable and smooth-working app. Over the past 18 months, I’ve only experienced one incidence of the Job Spotter app not working and that was due to a network data outage rather than any kind of problem at Indeed’s end. I also can’t recall a time when I found Job Spotter Verify not working. When I first undertook this Job Spotter review, back in 2017, it took around 72 hours to verify the submissions that I made. Since then, the Job Spotter customer service team must have been busy, as the review process has speeded up significantly. Many submissions are now approved within just a few minutes. You can review your submissions to see their progress via the ‘submissions’ screen. You can also check the ‘wallet’ screen to see how much money you’ve racked up. Once your submissions are approved, the money shows in your wallet. You can then redeem the money in exchange for an Amazon gift card. 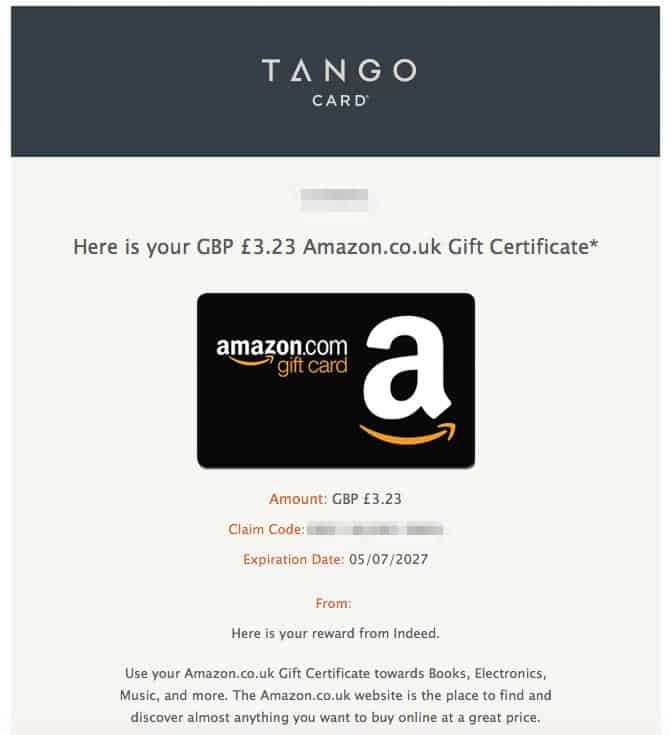 Once you cash out, your Amazon gift card arrives by email within a few hours. The only irritation I experienced when using the app was with three positions that were advertised at my local leisure centre at the same time. I photographed and submitted the three separate adverts, but Job Spotter rejected two of them as duplicates, even though they were for different positions and were shown on three separate notices. I was a little irked to discover that there’s no appeal process of Job Spotter contact option for rejections, but it was a minor irritation in the grand scheme of things. Job Spotter is delightfully easy to use. Over the past 18 months, it has proven itself to be something that I keep on my phone and use whenever I happen to be in a city – or even a small village that has a ‘help wanted’ sign. The speed of the process and the ease of everything from submitting photos to cashing out means that this is seriously easy money. Job Spotter won’t earn you enough to live on, but it can certainly generate a nice little bit of extra income each month for those who live in more populated areas. Of course, if you prefer to make a little extra money without the effort of leaving the house, then there are still plenty of other options available to you. If you think Job Spotter is for you, you’ll find it here. Far better for city folk than those in small towns, but if you fit the bill, you actually CAN earn money while you're out shopping. And that's pretty awesome. Previous ArticleTopCashback Review: Is This Genuine Easy Money? 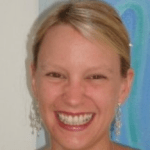 Louise became a freelancer by mistake after getting made redundant whilst living in a country with no jobs - but she hasn’t looked back since. She is committed to helping others pursue their freelancing goals and enjoy a happier work/life balance as a result.